The lovely formal garden is in bloom from early spring to late fall sprouting a boisterous array of colors from flashy red to sedate pink. The brick wall surrounding the garden provides a tranquil haven in which to sit undisturbed and get away from the hustle and bustle of city life. Peace reigns supreme in the Gordon - Roberts House Garden, a step back in time when the pace was slow and one was encouraged to savor the wonders of nature. 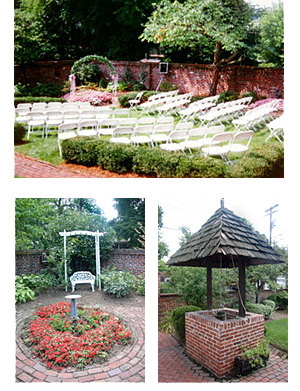 This lovely and intimate garden is the perfect setting for brides and grooms to recite their vows to each other in the presence of their family and friends.